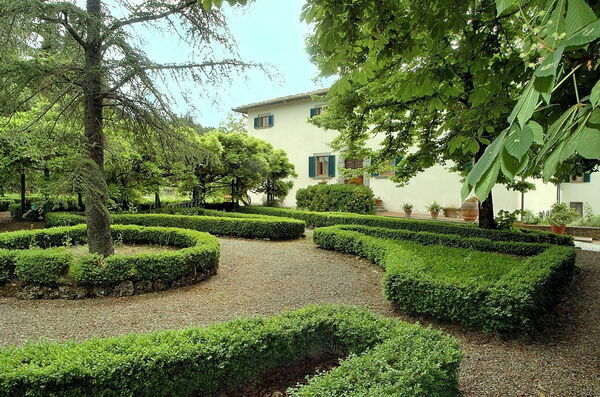 Large independent villa with swimming pool and tennis court situated in a panoramic location in the heart of the Chianti Classico area. The villa offers large equipped outdoor areas surrounding the entire property including a beautiful Italian-style garden and large green spaces. The furnishing provides comfortable interiors and a very large dining-room where it is possible to accommodate over 30 people. Thanks to its large outdoor and indoor area, the villa offers and ideal location for family reunions and events. Distances: the close town of Castellina in Chianti with any kind of shops is just 500 m away and it is also accessible on feet, Siena 15 km, Florence 50 km, the charming medieval town of Monteriggioni is 10 km away. At guests disposal: large equipped garden, private swimming-pool (7 x 13 m – maximum depth 3 m – open all year round), synthetic tennis court. Large covered parking, elevator in the villa, mini-bar in all of the bedrooms, hairdryer available in each bathroom. ADSL internet connection (free of charge). Parking within the property. Extra Services: daily maid service (4 hours a day) included in the rental price. 1200 m2. Ground floor (access via 5 steps): entrance to the villa, living-room, reception area, large dining-room, toilet, elevator, double bedroom with extra single bed and ensuite bathroom with bathtub, double bedroom with ensuite bathroom with shower (without window), large double bedroom with 2 extra single beds, ensuite bathroom with shower and small private terrace with access on to the garden (via an external staircase). 4 steps higher: double bedroom with extra single bed. 4 steps higher: access to a double bedroom with a sofa-bed and ensuite bathroom with bathtub and shower. 1st floor: 4 double bedrooms each with ensuite bathroom with shower (without window), large double bedroom with extra single bed, ensuite bathroom with shower (without window) and private terrace. All of the bedrooms on the first floor are provided with air-conditioning. Basement: 4 double bedrooms all of each with ensuite bathroom with shower, 2 double bedrooms with ensuite bathroom with shower and access on to the garden, living-room with access to the garden, breakfast room, well-stocked kitchen (freezer, microwaves, oven, dishwasher, fireplace, barbecue), store-room (freezer, slicing machine), toilet with shower (without window), laundry. Upon request double bedrooms can be turned into twin-bedded rooms. Additional costs paid on site: Security deposit: € 1.000,-Final cleaning: € 250,-Heating: according to consumption Air Conditioning: € 700,- / per week.